I have never been one to cook. I don't cook for myself and even with the best intentions, I don't really cook for the little dude. 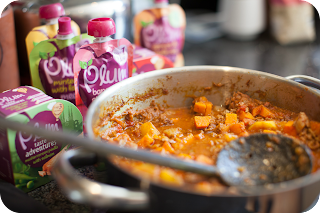 When we were invited to Plum's cookery school I was excited to see if they could persuade me that I can make a healthy meal for him. As well as being completely lost in a kitchen, I worry that any meals I make for him won't have the same nutrition and taste that the pouches we buy do. His health and well being is my priority so I need to know what I cook would be packed full of the right nutrition. We were invited into the home of Beverly Glock which doubles as a cookery school, helping ordinary people get comfortable in the kitchen. They invited 5 bloggers with young children along so that we could recreate their new taste adventure dish 'cape curry with beef'- one of Dylan's firm favourites. I was looking forward to seeing how it was actually made and getting to taste our homemade version. expected and went down very well as a lovely lunch for both adults and babies. The wonderful thing about the new taste adventure range is that the dishes are tasty and full of flavour so they are perfect for the whole family. We also made an oven cooked rice dish, Ross fil-forn which again was a lovely healthy meal suitable for weaning babied yet really easy to make. Getting children used to a variety of flavours and tastes at an early age is very important and Dylan is definitely at the stage where he can handle something a bit stronger. 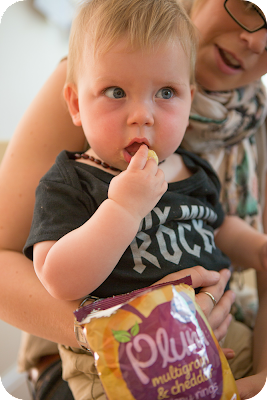 He enjoys mild spices in his food and the taste adventures range are perfect for encouraging this. These delicious dinners have persuaded me that healthy food is not that hard to cook. Making the sweet cape curry Beverly showed us where you would seperate it if you were cooking for the whole family, and you could add salt and stronger spices to one portion, whilst keeping the other baby friendly. Tasting the final dish however, there is no way I would want to add salt. The flavours were divine and salt would have added nothing. This meant it would certainly be healthier than the usual meals we eat! As well as creating and tasting these wonderful dishes, we were also served some of Beverly's other creations - yummy homemade muffins using Plum baby fruit puree instead of extra sugar. They were sweet and fruity and the lack of sugar meant it was perfectly acceptable to eat two, or maybe three. . . my kind of cake! It was even ok to share them with the little people, although they seemed more than happy with the wonderful snacks provided by Plum. We had a wonderful day at the Plum Cookery School and learnt a lot about what goes into the baby food we feed our children and how easy it is to cook a healthy and nutritious meal for them packed full of flavour and goodness. Dylan learnt that if he smiles sweetly at the right people he gets lots of snacks! 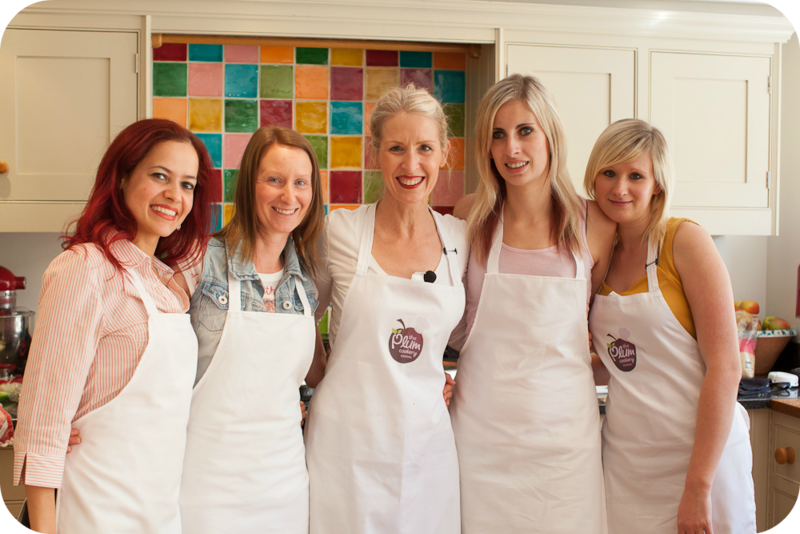 Disclaimer: I was invited to the Plum cookery school and my expenses were paid. I also took home a lovely goody bag. I was not told what to write though, so all thoughts and opinions are my own. It was a very yummy day! I cooked up the Ros Fil Forn for dinner the other day and it was a massive hit with both Luke and Leo!